TW Saddlery utilizes the Fitting kit system designed by sister company Specialized Saddles. 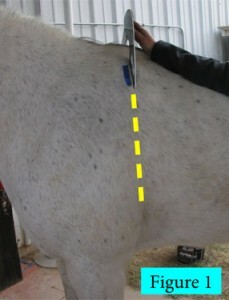 With the fitting kit you will take measurements of your horse that will determine the size of fitting cushions that should be used with your saddle as well as the shims in the loin and shoulder area of the saddle. All TW Saddlery saddles can be ordered with the fitting kit. The kit will be sent to you with instructions and a return shipping label prior to your saddle shipping. When you have completed the fit process return the gauge and loin inserts in the envelope provided. Send measurements to orders@twsaddlery.com and reference your order number in the subject line. You may also call 915-345-413. The measurements will be reviewed by TW Saddlery fitters and used fit your saddle. The fitting kit requires a $100 refundable deposit. Once the fitting kit is received back the $100 will be credited to your card. Shipping is $35. A. Select a spot approx 5" below top line in a vertical line with the back of front leg, or so called "girth groove". 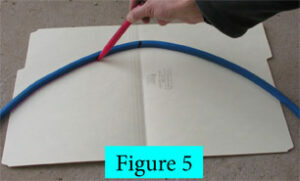 (see figure 1) Put a small piece of tape there. B. 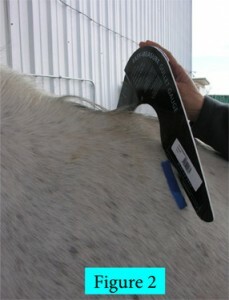 Measure at tape * back edge of line* with gauge, leaving approx an inch thickness, from gauge bottom to horses top line (not hair). (see figure 2) If measurement is close to edge of another wider color, indicate with a plus + sign, if width measurement is close to junction of a narrower color, use a minus. Example, red +, would indicate the measurement is close to junction of red and grey, red indicates measurement is close to junction of red blue. C. Using a ruler or tape measure backwards from tape (point of measurement) to a point 18" behind first measurement, along back and put another small piece of tape. 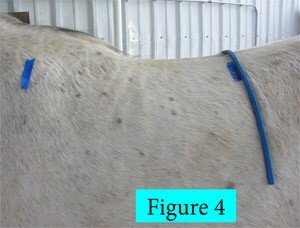 (figure 3) At this point measure in a vertical axis using the blue flexible rule, the loin/back profile, pressing down along entire curve,to shape the blue curve to shape of horse. 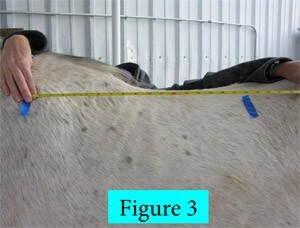 Lift slightly and replace to see that shape of curve matches shape of horse. (See Fig 4). Make sure center of flex rule (black mark) is centered on spine when placing for shape. E. Mail gauge, flexible ruler and loin tracing with width color measurement written on it, to us in addressed envelope. Note: Include your name, address, and order number, and phone number on tracing.